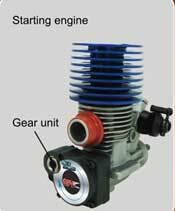 Detach the pull start from available engine and replace it with set-supplied gear unit. 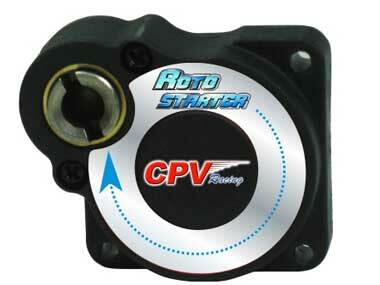 The engine can be easily started by inserting drive shaft in and pressing the start button. FET switch and safety circuit protect unit from overload and provide reliable operation. 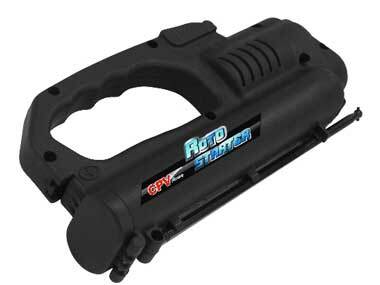 You may make holes in the body shell for glow ingitor and roto starter to enable starting engine without detaching the shell. Install set-supplied gear unit onto the engine. Lock glow ignitor onto glow plug, insert hex drive shaft into gear unit, and then press start button. Please read the instruction carefully to get full information about this apparatus before assembly. When assembling this kit, you may use tools such as knives. Take care to avoid any injuries. To avoid accidents, do not point the hex drive shaft to others. Keep it out of the reach of children.Do not put any parts in the mouth or put vinyl bag on the head.